CW3E works closely with Sonoma County Water Agency (SCWA) on the application of atmospheric river science to inform water management practices in the Russian River. SCWA and CW3E are leaders on the Forecast Informed Reservoir Operations (FIRO) project. FIRO is a proposed management strategy that uses data from watershed monitoring and modern weather and water forecasting to help water managers selectively retain or release water from reservoirs in a manner that reflects current and forecasted conditions. FIRO is being developed and tested as a collaborative effort focused on Lake Mendocino that engages experts in civil engineering, hydrology, meteorology, biology, economics and climate from several federal, state and local agencies, universities and others. 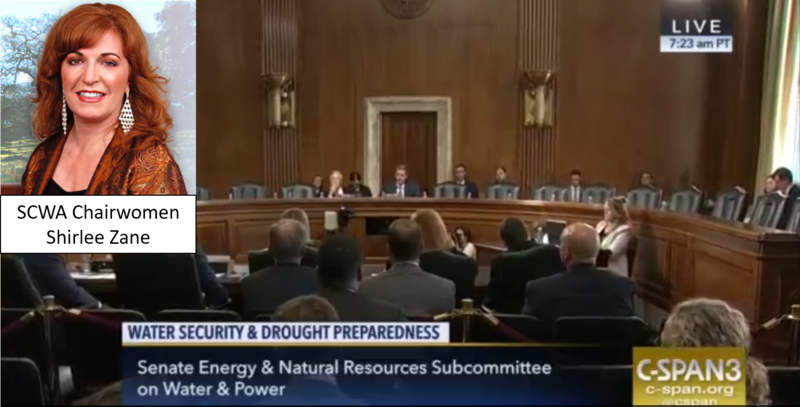 Shirlee Zane, SCWA Board of Directors Chairwoman, today testified before the Senate Committee on Energy and Natural Resources’ Subcommittee on Water and Power to discuss the many innovative water supply and drought resilience initiatives the Water Agency is currently implementing, including FIRO. The purpose of the hearing was to examine increasing water security and drought preparedness through infrastructure, management and innovation. “I was honored to testify and share with the committee the innovative water supply management tools the Sonoma County Water Agency is developing and implementing,” said Sonoma County Water Agency Chairwoman Shirlee Zane. “Securing our water future means thinking outside of the box and not being afraid to lead by example. That is exactly what the Water Agency continues to do as we develop first-class initiatives with our partners. Our investment in water innovation can be replicated across the nation. I am excited to share our experiences to help build innovation in the water industry.” Zane highlighted FIRO, amongst the many innovative water management programs the Water Agency is currently implementing. For video of the briefing click here.